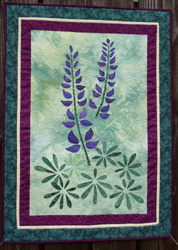 Lupine is a pattern by Bobby Jarrett. My version in the private collection of Bill & Deb Velacich. The Prima Jacket Pattern by Akasha is a very simple, easy to put together jacket. It allows room to create and embellish. 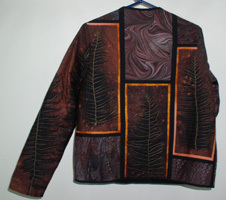 This jacket began with black fabric, ferns and an experiment in bleach discharge. I chose the hand marbled fabric that complimented the discharged fabric . Four different marbled designs of Chocolate Brown, some scraps of hand dyed burnt orange and black for accent. I constructed the fabric by attaching it to heavyweight flannel. The ferns needed something to bring them out. I found the solution by machine quilting the vein of the stems with gold thread. All that was left was to cut out the pattern pieces and assembled the jacket. Pansy by O’Carol Designs is my newest creation. I used a combination of my Hand Dyed fabrics and my hand marbled fabrics. The combination of the two give the pansy a lot of depth and texture. I did not follow the pattern color choices, because I wanted to recreate the pansies that I grew outside my tent in Alaska. I downloaded some photos of my favorite pansies and used them for inspiration and color choice. 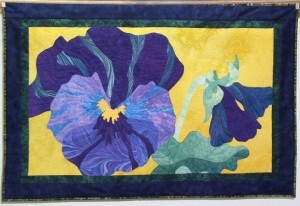 The Pansy is lightly machine quilted with much denser quilting on the background, so the pansy stands out. You might say I love bright colors. 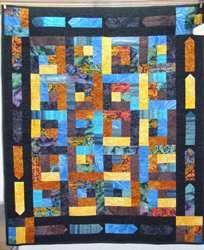 I am always on the lookout for a fast and easy quilt to use as a baby quilt or charity quilt. Crayons is perfect. This is a lap/crib size and it uses 8 Fat Quarters and 1 1/2 yards of black for the border. But the great part is the quilt can be expanded to a King size by adding more Fat Quarters. You stack up the Fat Quarters and cut them out all at the same time, sew the blocks together and add the borders. If you are in a real hurry don’t add the crayons in the borders. My version contains three hand marbled FQ, one FQ from Bold Over Batiks and four batiks. Bright, cheerful and eye catching. It is very rewarding to see my hand marbled fabric made into wonderful creation by others. This is Summer Waters by Diann Smith. 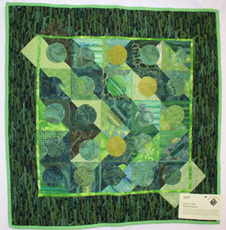 I was so excited to see that she had used my green hand marbled fabric as her focus fabric. 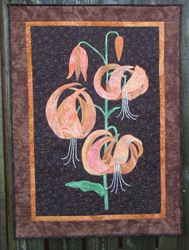 Tiger Lily is designed by Bobbie Jarrett. I used 3 different hand marbled fat quarters (med orange, orange/yellow, lt orange). 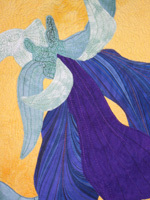 I Machine quilted the lilies following the design of the hand marbled fabric. It came out better than I had envisioned. 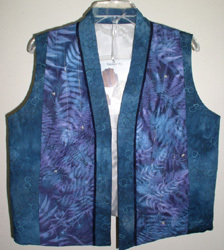 This vest is also made using the Venetian Vest by Brensan Studios. For this version I used sun printed fabric for the accent panel. I added extra leaves using thread. I also added some rain with some sparkly thread. 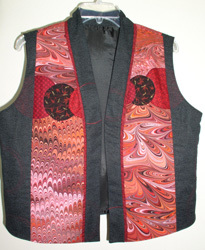 The side panels are hand dyed fabric and then machine quilted to give texture. 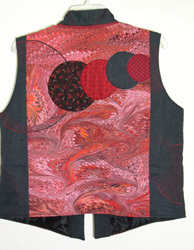 This vest is made from Venetian Vest by Brensan Studios. It’s easy to make and comfortable to wear. 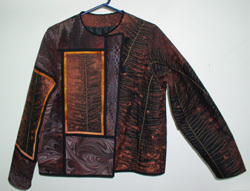 It is perfect for wearable art. 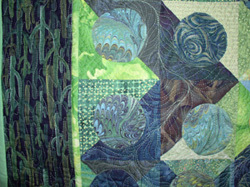 The panels are great for piecing and embellishing. 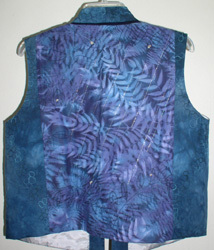 I used three different hand marbled fat quarters in the pannels. The black side pannels are embellished with red thread.